Dimensions 1 by 7 by 9 in. 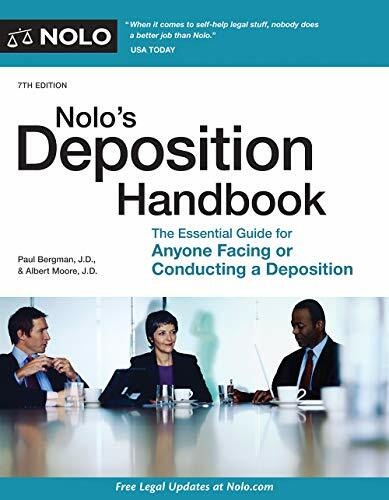 Noloâs Deposition Handbook is a must-read for anyone taking, defending, or facing a deposition. Youâll find all the information and instructions you need, whether or not a lawyer is representing you. Packed with concrete suggestions and examples, this book explains how to arrange a convenient date, prepare for the deposition, and respond to questions with confidence. Best of all, youâll learn the three âgolden rulesâ for answering questions, and the trick questions lawyers often use to influence testimony. anyone involved in a deposition. The 7th edition is updated to include information on electronic discovery and the latest statutes, court cases, and federal rules.